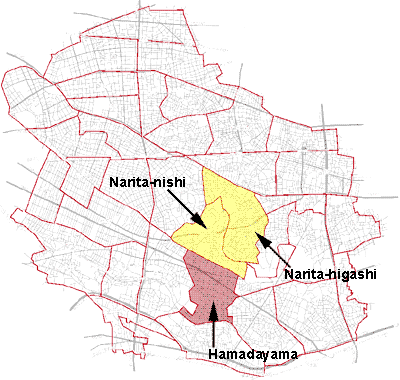 There are two districts with the name of "Narita". "Higashi" means "east" and "nishi" means "west". Hamadayama, which is handled in another article, is the southern neighbor. Two old road are seen here. 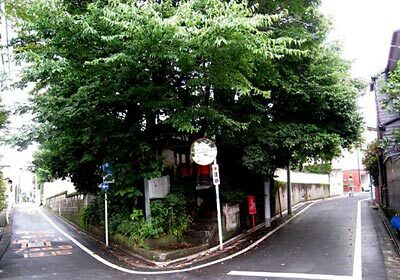 Kamakura-michi (left - This was the road for farmers to bring their annual tribute to the regional capital in the ancient time.) and an old part of Itsukaichi-kaido(right). At the crossroad there is an old cult place. Three stone Buddhas are placed there. 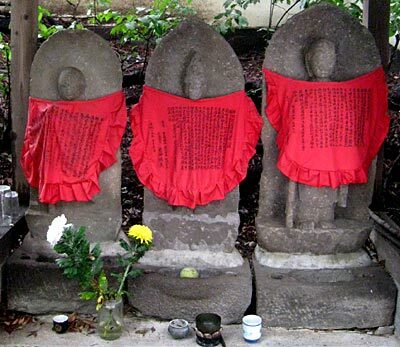 From left to right: Jizo (1753), Horsehead Kwannon (1760) and Jizo (1698). Houshouji Temple. Once the village temple of Narimune commune. I want to trace back the history of the area, where I live now. The area is called "Narita", a district of Suginami ward of Tokyo. Different from Western countries, the Japanese address system is not based on street names but area names, and sub-areas of a district are expressed by using a sequence of three figures, for example "1-2-3". This reads like "1 chome, 1 banchi, 3 gou" and narrows down in three steps the referred area. It was in May 1962, two years before the Tokyo Olympic Games, when a law related to the new address system was introduced to give every house a number, and the three-figure-system was introduced in this context. Unfortunately, the new policy destroyed many traditional place names. Therefore, lots of people protested against this foolish reform, which heavily damaged our tradition and history, but without success. For example, my district Narita was newly created in relation to the introduction of the new system and when Narita became a place name, two old names, Narimune and Tabata, were abandoned. Exactly speaking, "Narita" was adopted as the name for an elementary school in 1884. 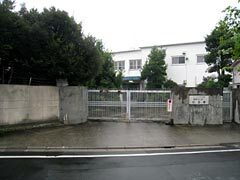 "Narita Elementary School" is now called as "Suginami NO2 Elementary School". 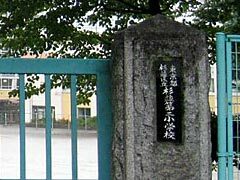 The first elementary school in this area was built on the border of two villages Narimune and Tabata and people thought that the combination of two village names would be appropriate, using "na" from Narimune and "ta" from Tabata. I think it is a good idea to use a combination of two names of the relevant communes for a school, which serves both communes. However, using it as a name for the entire area really destroys tradition and history. It is sure that both Narimune and Tabata communes had these names already before the Edo period (1603 - 1867). But, there are no contemporary written materials proving the origin of those place names. The explanation of the place name Tabata is rather simple. There was a village beside paddy fields, therefore it was called Ta-bata - "ta" means paddy field and "bata" or "hata" means "at the edge of". 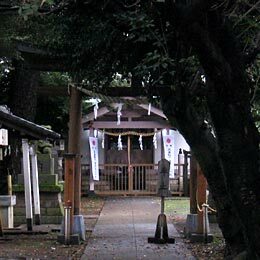 According to the records of Tabata Shrine, around 1400 a samurai family settled down in this area and invited Sugawara-Michizane as deity and established the shrine. "Tabata" might be originally the name of this shrine and later used as village name. The entrance of Tabata Shrine. Where there was once a watchtower - Yagura, a seminar house of a women's university exists now. senior brother. It is not clear when those samurais lived. Maybe sometime in the Kamakura period (1192 - 1333) or Muromachi period (1336 - 1573). According to an old document of Ando family in Narita, the founder of the family was a samurai in Kamakura, but came to this area and settled down in Ozaki, a part of Narimune village, in 1312. 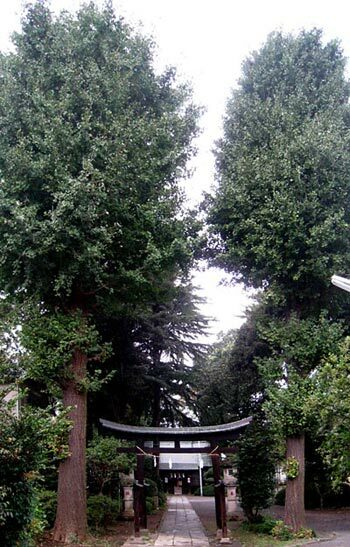 Ando family founded Kumano Shrine as its family shrine. 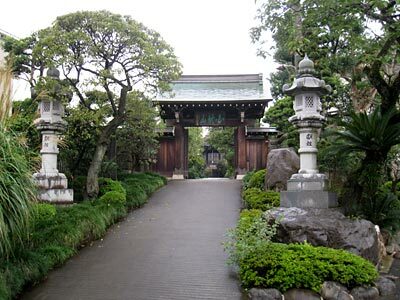 Houshouji, once the village temple of Narimune, was founded in 1594, according to the oral tradition of the temple. However, due to the fire in 1850s the documents of the temple were destroyed and we can not tell about the history of the temple with certain accuracy. The interesting fact is that many stone monuments were excavated from the ground of the temple and they date between 1312 and 1495. We also know that a Buddha statute of the temple was built in the Muromachi period (1336 - 1573). Therefore we may conclude that there was an temple already before the foundation of the present Houshouji and according to the oral tradition of the Ando family, this old temple also belonged to the family. Then, it is plausible to conclude that the ancestors of the Ando family made the oldest stone monument escavated in Hoshouji. But, as we cannot read the detail of the inscription, nothing is sure. As for a slightly later period, there is an official document dated 1559 of the Hojo family, who was the dominant "daimyo" in the Kanto region, saying that Narimune was a fiefdom of Magoshiro Shimazu, who was a vassal of Hojo and lived in Edo-castle. Then, in 1625 Narimune and Tabata became a fief land of the Family Okabe. However, it was taken up again by shogun government in 1698 and remained in the hand of shogun till the end of the Edo period (1867).